MANHATTAN, KS – Charles Mann scored 17 points, including two game-sealing free throws with five seconds left, as Georgia closed out 2014 victoriously by defeating Kansas State here Wednesday night. The Bulldogs (8-3) once led the contest by as 15 points midway through the second half. K-State, however, fought back and even took command in the game’s waning stages. 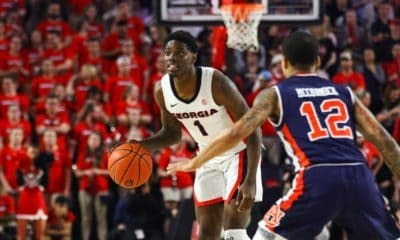 Several key plays, however, restored the lead for Georgia and proved decisive in posting its second road win of the season. K-State (7-6) took its first lead of the second half at 42-41 on a 3-point shot — its only one of the game — by Nigel Johnson with 4:31 left. A layup by Thomas Gipson, who led all scorers with 19 points, at the 3:39 mark matched the 3-point margin for the Wildcats. For the game’s remainder, Georgia outscored KSU 9-2 to claim victory. Perhaps the game’s biggest bucket came when Nemanja Djurisic drilled a 3-pointer from atop the key with 1:07 left, giving the Bulldogs a 47-46 lead. After a K-State time out, Nigel Johnson missed an open 3-pointer. Djurisic ran down a long rebound with 26 seconds left, was fouled and made one of two free throws. 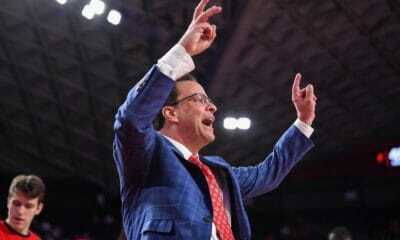 After another KSU time out, the Wildcats failed to convert again. Mann was fouled on the rebound and sank the clinching free throws with :05 left. Georgia broke free from a closely contested, low-scoring game with a run late in the first half. 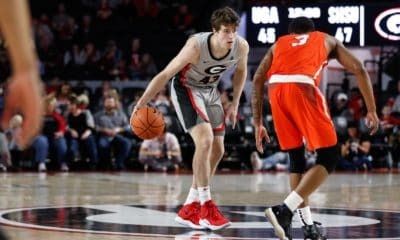 Georgia, in fact, scored the last nine points of the first half, covering 6:32 off the clock, to take a 20-12 lead at intermission. The lead grew into double digits early in the second period. Two foul shots by Mann with 12:10 left got the Bulldogs their largest lead of the game at 35-20. Shortly thereafter, Kansas State found its footing and fought its way back into contention. The Wildcats got their deficit back into single digits 37-28 on Gipson 3-point play with 10:39 left. They converted three straight Georgia turnovers into baskets, the third a layup by Tre Harris that cut the margin to 39-37 at the 5:52 mark. Fox twice called time out to settle down his team, lastly after K-State had taken its first lead of the half. 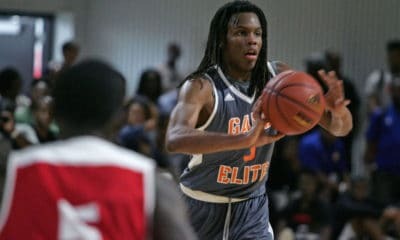 Once the Wildcat lead reached three for the final time, Georgia gathered its wits and made key plays at their most opportune times. Georgia will complete its non-conference schedule this Saturday at home against Norfolk State in a 2:00 p.m. tipoff. The Bulldogs will open SEC play next Tuesday night at home against Arkansas.